I made this Chocolate Roll Cake with Pecan Buttercream for my Thanksgiving dinner, along with my pumpkin cheesecake. And it was very surprising to see how much more my guests preferred this over my cheesecake. That’s because I make the pumpkin cheesecake every year. It’s expected, demanded. And possibly, my favorite cheesecake. So it was kind of surprising when I saw all the eyes turn to my roll cake. The cake was bigger than the pictures show. Because I am a good host, I couldn’t spend my time taking pictures of my cake. I had to visit with guests and cook the 27485 dishes I decided to serve and make sure they were all gonna be done at the same time. So, at dessert time, I had to sit there, slicing that beautiful unphotographed cake with tears in my eyes. It’s ok. I can always use another excuse to make some more roll cakes. It’s just that my list of things to bake is so extensive that next time I make a roll cake it will be a strawberry one, or a guava paste one (famous Brazilian roll cake) because I like to mix things up. 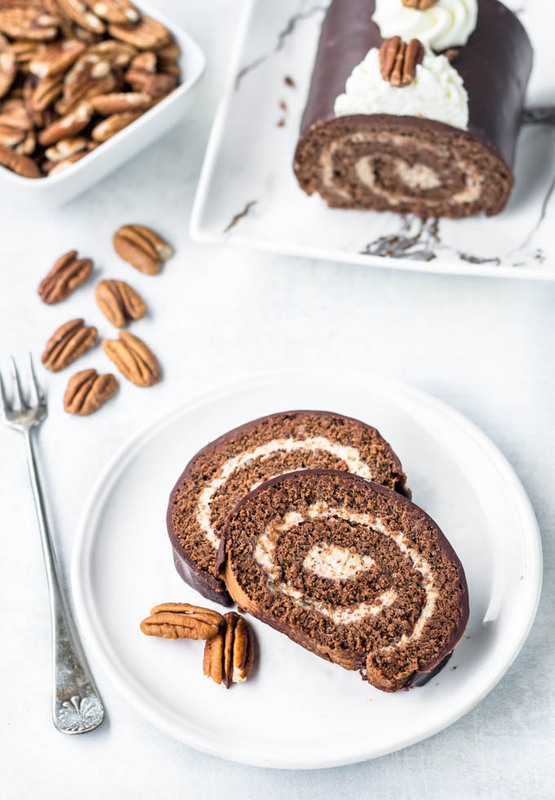 I honestly don’t think I will go long without baking this Chocolate Pecan Roll Cake though, because I’ve already been requested to do so. Cmon, guys, calm down, you had a slice yesterday! But I understand. It was an extremely delicious cake. I am not one to brag (sometimes I do, though), but I seriously think this cake could be in the shelf of a renowned bakery. I can’t speak for you guys. But speaking for myself, my son Luke (who devoured 2 slices), my husband Brian (who ate a huge slice even after I asked him to wait until I could photograph what I had left of the cake) and my guests, this cake will make you go: YUMMMMM. Just like that! Out loud. You will sit there, you will take a bite, you will close your eyes and try to imagine if it’s even true. It’s true. Now go make this cake so you can brag too. And if you’re into more things chocolate, check out these Cashew Nutella Brownies Recipe. 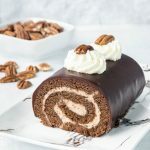 This Chocolate Roll Cake with Pecan Buttercream will make your dreams come true. Grease a jelly roll pan (10x15 inches) with butter. Line it with a parchment paper and grease the paper lightly with some more butter. Sift cocoa powder, flour, salt and espresso powder and set aside. Mix eggs and sugar together in a heat-proof bowl, place it over a small pot of simmering water, making sure the water isn’t touching the bottom of your bowl. Whisk eggs and sugar continuously for a few minutes. When a thermometer reads 120F temperature, remove the bowl from the heat. In case you don’t have a thermometer, go get one! No, just kidding. It just makes life easier. But you can touch the mixture and when it feels a little bit hotter than lukewarm, it’s time to remove from the heat. Transfer to the bowl of a mixer and beat eggs and sugar mixture on medium speed for 4 minutes until you reach the ribbon stage. Add melted butter to the eggs and sugar and fold with a spatula. Add flour mixture and fold again. Don’t overmix. Stir just until everything is combined. Spread batter on prepared pan and bake in the pre-heated oven for 5 minutes. Lay a clean kitchen towel you have no attachments with on a flat surface, sprinkle it generously with cocoa powder. Flip the hot cake onto the towel and roll the towel and the cake into a log. Set cake aside and let it cool completely in the log shape. Unroll the cooled cake and spread the filling all over it’s surface and roll it back into a log. Trim edges so they are even. Place cake on a baking sheet fitted with a cooling wire. Place it in the fridge for at least 30 minutes or in the freezer for 15. This way the cake will be cold when you pour the ganache over and it will help the ganache set nicely. Pour ganache all over chilled cake and let it set. 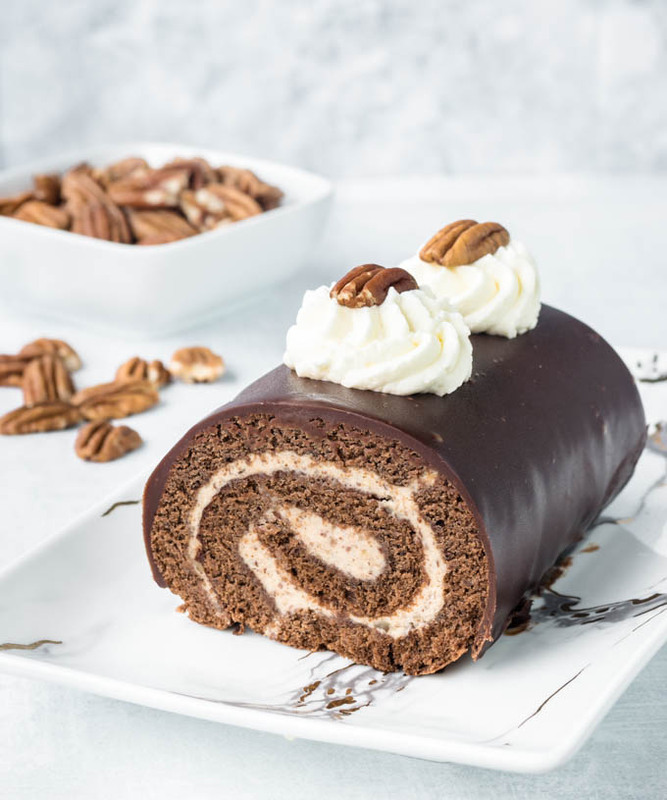 Transfer carefully to a platter and decorate the top with whipped cream and pecan nuts. Heat the milk in a small saucepan just until you see the first bubbles forming. Don’t let it boil. While the milk heats, whisk yolks and sugar vigorously in a bowl until lightened in color and thicker in volume. Add ground pecans to yolks and sugar mixture and stir to combine. Once you’ve heated the milk, temper yolk mixture. To do this, simply pour a little bit of the hot milk into the yolk mixture while whisking without stopping. Once that first little bit is incorporated, start adding the hot milk slowly while whisking. After all the milk has been added to the yolk mixture, transfer everything to the same saucepan where you heated the milk. Bring it to a boil over medium heat, stirring constantly. Don’t stop stirring or the mixture will burn. Cook it for 2-4 minutes until mixture is thickened. Remove from the heat. Let it cool 5 minutes and add vanilla extract in. Cover with a plastic wrap tight directly on the surface of the custard, so this way it won’t form a crust as it cools down. Refrigerate until completely cooled down, about 2 hours. Once mixture has cooled down, remove from the fridge. Beat 5 tablespoons of butter with a mixer on medium speed until creamy and fluffy for about 2 minutes. Add pecan custard and keep beating until everything is incorporated. Chop chocolate and place it in a bowl. Heat heavy cream until just before it comes to a boil. Pour hot cream over chocolate and let it stand for a minute. Stir continuously until chocolate is completely melted. In case you see bits of chocolate that haven’t melted, stick the bowl in the microwave at 10 second intervals, stirring in between until you see no more pieces of chocolate.